Have you experienced it too? All the berries and fruit in the garden ripen at the same time and you simply can’t eat them fast enough? There were heavenly ripe tomatoes going for a bargain seasonal price at the market – and you couldn’t resist and bought kilos of them. But who’s going to eat them all before they go rotten? So isn’t it great to know that there’s a way of preserving and keeping all these surplus amounts of food, retaining the vital substances in the process, in raw food quality and without any additives, so that you can rescue the delicious taste and stored energy of the sun for the less bountiful months of winter. Sedona raw food dehydrator: Dehydration is the magic word! Dehydration is the magic word. Drying. Dehydration. It works so easily in the sun – climate permitting. When it’s not permitted by the climate, as is generally the case here at home, the solution is a good dehydrator. Like the new Sedona Raw Food Dehydrator, for example. The temperature is measured digitally and regulated with extreme accuracy. So you can be absolutely sure about the raw food quality of your food: all the vital nutrients, vitamins, enzymes, etc., remain intact if you prepare your food at temperatures below 43°C! 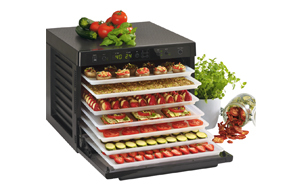 With 9 trays the Sedona dehydrator offers plenty of space for drying your rich harvest of tomatoes. Or for preparing raw food recipes for the whole family – because apart from drying of fruit, vegetables and herbs it can naturally also be used for preparing raw food bread, raw food crackers, raw food pizzas and much more besides! This entry was posted in Diary, General, Raw food appliances for your health. Bookmark the permalink.